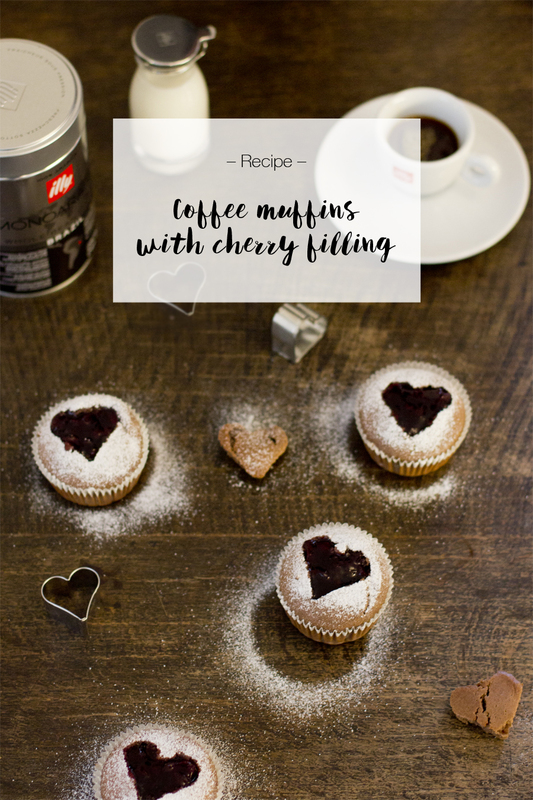 If you’re still looking for a recipe to finish off your Valentine’s Day dinner, theses coffee muffins might just be it: they’re full of flavor and coffee – bound to awaken your senses and everything that comes after the dinner. I’m talking about a nice evening stroll and watching a movie! What did you think?! Inspired by the bold flavors of the coffee of the month: illy Monoarabica from Brazil I created a bold recipe that compliments its sweetness and bitterness. These muffins have a huge amount of coffee in there and that makes them taste not too sweet which I really like. Together with the yoghurt it’s also not to heavy. We don’t want to roll from the dinner table to the couch because we can’t move anymore, right? That’s not romantic! 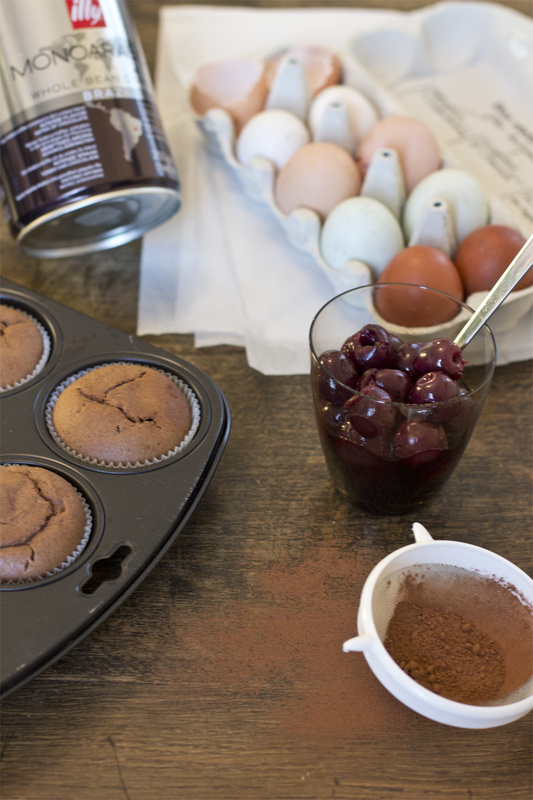 Preheat the oven to 180 ° C. Put the egg, sugar, oil, yoghurt and coffee into a bowl and whisk well. Sieve the flour, baking powder, salt and cacao powder on top and combine well. 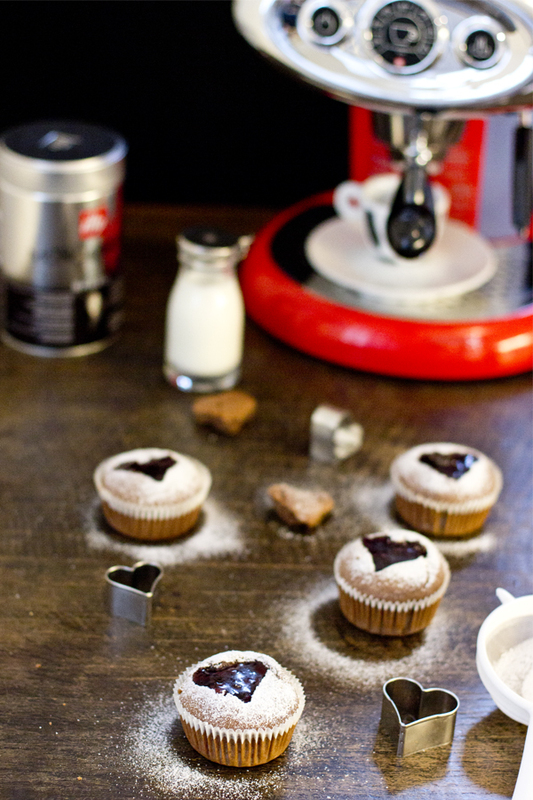 Line a muffin tray with paper cups. Fill in the mixture to 2/3 of its height and bake for 20 to 25 mins. Put them out of the oven and let them cool. Meanwhile cut the cherries into small pieces. Put them into a pan with 4 Tbsp of the juice, the espresso and the sugar. Heat them slowly. Mix the corn starch with the rest of the cherry juice in a cup. Add slowly to the heated mixture and stir well while bringing to the boil. It should harden a little like pudding. 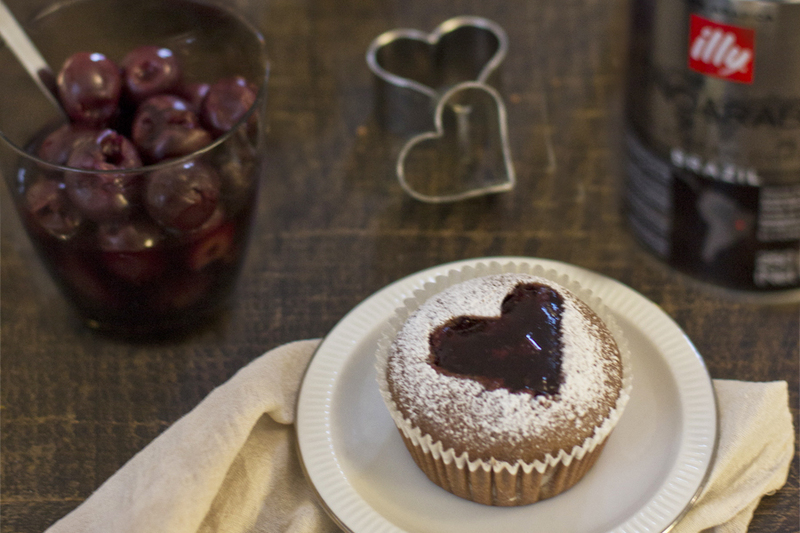 Take the muffins and cut out little hearts with cookie cutters. You might need to take little knife to get the shapes out of the body. Now fill the holes with the cherry mixtures and sieve the powder sugar on top. 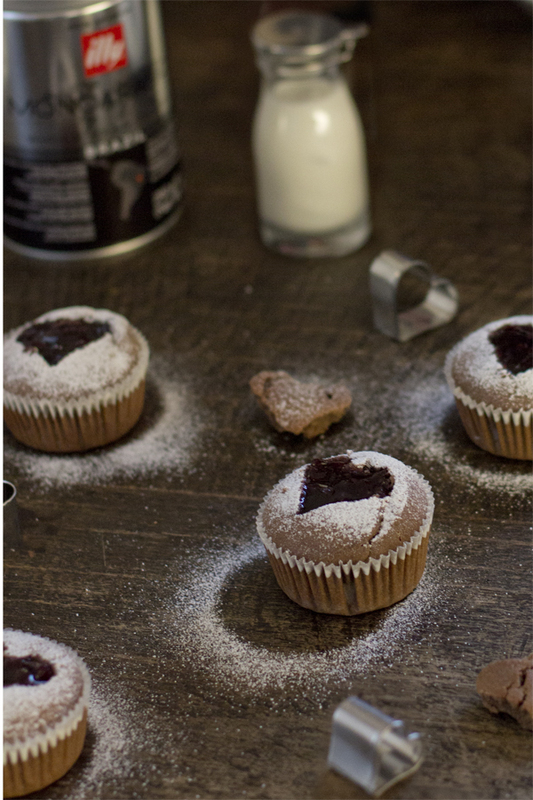 Because the filling is still wet, it will dissolve the sugar and leave it untouched on the muffins. This makes the hearts stand out even more. Don’t they look romantic but not too cheesy – just right for me. I’m just enjoying dinner with my boyfriend and besides the fact that I don’t like the commercial side of Valentine’s Day, I love the little gestures like sharing the second one of these. 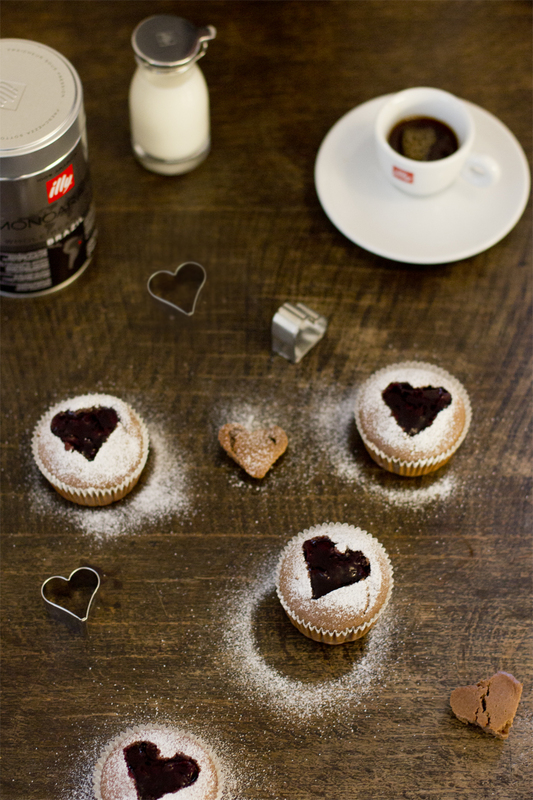 Isn’t love all about the little things in every day life?